Lynn Thomas Homes, INC, operating as The Lynn Thomas Real Estate Team, announced the sale of the company to Kathryn Sotelo effective September 1, 2012. The Lynn Thomas Real Estate Team will be renamed and rebranded as At Home in Louisville Real Estate Group. The business focuses on a Team approach with dedicated specialists in the form of Exclusive Listing Specialists, Buyer Specialists, Marketing Specialists and a Client Services Department. “I love the team approach because of the service and results it enables us to provide our clients. Our Team Members have the ability to spend their time working on their clients’ specific Buying or Selling needs and don’t have to worry about the administrative portion of the business. Couple that with the backdrop of the forward-thinking, learning-based Keller Williams Brokerage, and we know we’re in the right place,” stated Kathryn Sotelo. 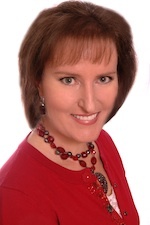 Kathryn Sotelo has been a licensed real estate agent since 2003 and worked for the fifteen years prior as a Vice President of Marketing in the Hospitality Industry. Lynn Thomas Homes, INC is a Real Estate Company that originated in 2005 and operates under the Brokerage of Keller Williams Realty Louisville East. The company has seven team members and looks to add two more Buyer Specialists and one more Listing Specialist before June of 2013. Perry and Lynn Thomas set out for their next adventure. 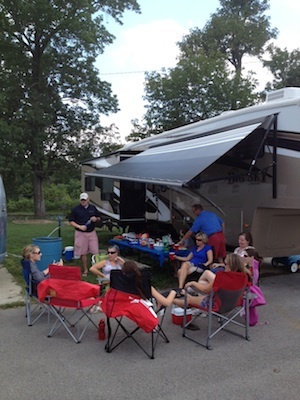 So, the At Home in Louisville Real Estate Group gathered for a fairwell send off. Perry and Lynn are heading out to train and coach Keller Williams agents all around the country. As a way to say goodbye, the team gathered to see the RV Perry and Lynn will be traveling in, have a picnic, and share some laughs. It was an amazing day. The sun was out and the lake was clear. Perry and Lynn's rig was parked in Shelbyville Lake. Everyone on the team, Kathryn, Shaunta, Lauren, Clayton, Mellissa, and Katelyn attended. Kathryn brought her son Daniel also. 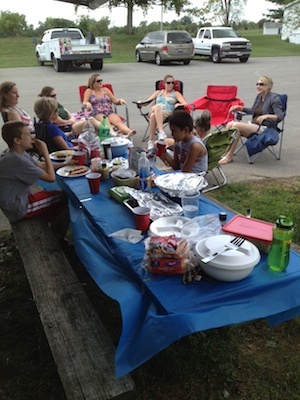 The boys explored, played horseshoes, and did some fishing while the adults talked and ate. The real estate stories flew around though the tears and laughter. It was a great day on the lake as the team all grew a little closer. It is bitter sweet that Perry and Lynn are leaving. It's also nice to know they are going to be in constant contact with the team as they continue selling Louisville Homes. This Sunday August 26th, the At Home In Louisville Real Estate Group will be holding an Open House at 1135 Oneida Avenue! For more information CLICK HERE! 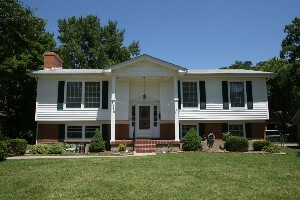 10711 English Oak Ct, Louisville, KY 40241 is a spacious four bedroom trilevel home on a shady lot in Seven Oaks. A hardwood foyer greets visitors and opens to a sunny Living Room featuring an arched ceiling. The open Kitchen includes lots of cabinet and counter space, a double sink, hardwood floor, and a good sized dining area. The enclosed three season sunporch is a special treat offering over two hundred additional square feet of entertainment space. The porch exits to a pleasant wrap around Deck. A nice sized Master Bedroom with private tiled bath and two attractive secondary bedrooms are positioned on the second floor. The secondary bedrooms are conveniently located to another Full Bath. The finished basement contains another bedroom along with a Laundry Room, Half Bath, and a comfortable Family Room with hardwood flooring and brick fireplace. 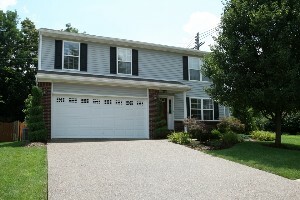 10711 English Oak Ct, Louisville, KY 40241 is a wonderful option in Louisville Real Estate and includes a two car attached garage, newer roof, new carpeting, and more! Give us a call to see this home today! Join At Home In Louisville this Sunday August 26th from 2-4pm and view FOUR spacious Condo's in the Swan Pointe Subdivision! 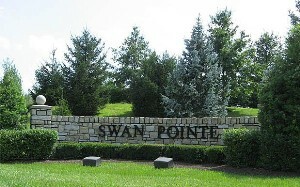 Swan Pointe is a wonderful modern condo community in the heart of Middletown and offers convenient access to shopping, dining, and expressways. The community is located near Southeast Christian church a half mile from Blankenbaker Parkway on Ellingsworth Ln. All units are spacious and open and the subdivision provide residents with a private pool and excercise facility. What a great place to make a new home! To see all homes currently available in Swan Pointe click here. To view a full list of all upcoming Open Houses click here. Join At Home In Louisville Real Estate Group this Sunday at 4604 Kiefer Road! You will fall in love with this four bedroom home, beautifully updated throughout! Granite counters, new doors, new lighting, and new appliances! Don't miss it! For more information about this home CLICK HERE! If you would like to see other open houses in the area click here for more information. 4811 Middlesex Drive- Open House this Sunday August 19th from 2-4pm! Please join At Home In Louisville Real Estate Group this Sunday at 4811 Middlesex Drive in Bay Tree. You will love the fabulous updates throughout including new landscaping and irrigation system, insulated garage, security system, new furnace and ac system! 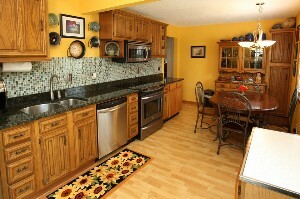 The home also includes modern stainless appliances and granite countertops! Don't miss this one! For more information on this home CLICK HERE! 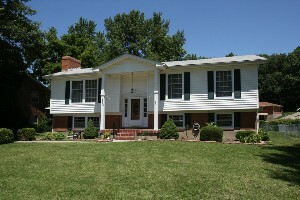 Join At Home In Louisville Real Estate Team this Sunday at 1135 Oneida Ave! You will love this five bedroom home in Iroquois Hills with fresh carpeting, hardwood flooring, attractive landscaping, and fully fenced yard! For more information CLICK HERE!